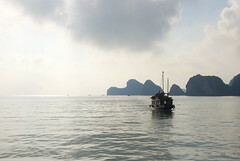 Named one of the new natural wonders of the world by UNESCO, Halong Bay is a true landmark of Vietnam. I’d seen pictures of the jagged rocky islands protruding from the sea hundreds of times, but nothing could compare to seeing it with my own eyes. 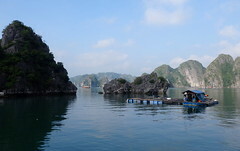 Deciding against the classic backpackers party boat, we booked a mid-range, three-day/two-night package on a junk boat; one night spent anchored in Halong Bay itself and the second at beach bungalows on Cat Ba Island. I couldn’t wait! This was the trip I’d been picturing since first planning to come to Southeast Asia. After slight confusion with our pickup (as usual), we clambered onto the bus that would take us to Halong City. We were glad to be greeted by a bus full of passengers of a wide range of ages. Had to be said we’d been slightly worried that we’d be the only younger crowd – but with five of us (joined by a familiar face from back in Phnom Penh), we’d have a good time whatever. After a breezy four hour drive, we arrived at the dock. There were boats everywhere. Literally everywhere. Thank goodness for fenders! Please note: The buffers here probably couldn’t even pass as fenders, but I thought it was more appealing that saying ‘old car tyres’. 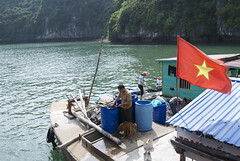 Due to the insane abundance of boats, we boarded a smaller tender that would take us to our boat ‘Imperial Junk’. Bobbing up and down, wishing I’d remembered to buy more travel sickness pills, we looked around anxiously for which boat was ours. There were some fantastic boats, not quite superyacht standards, but I did spy a few sun decks. There were also a few that had a ‘not-so-seaworthy’ look about them. With bated breath we finally turned up at Imperial Junk and I have to say, she was charming. Although it was only midday I was ravenous. Good job as plate after plate was brought to the table… all seafood. I’ve never been a fan. I’ve only recently gained a fancy for battered cod. To a seafood fan, lunch on the boat would be a dream: squid, shrimp and fresh fish piled high. As I said, I was hungry, but I did draw the line at the tentacley squid. 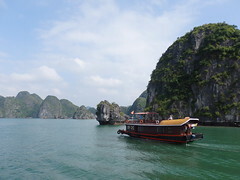 – Halong Bay literally translates to ‘descending dragons’. The Vietnamese folk tale says that long ago, in a time of war, the ancestors sent down dragons to the bay. They would appear in front of enemy’s ships as islands, stopping them in their tracks. After the war, the dragons decided to stay in the beautiful bay and are still there to this day. – There are over 2,000 islands. 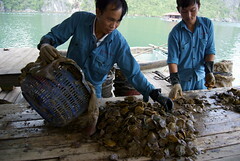 Over 1,000 of which are named. Our first stop that day was a place called ‘Surprising Cave’, which couldn’t have been that surprising as the world and his wife were also visiting at the same time. The first two caverns were beautiful, but the third was indeed surprising. Stepping into the 30m-high cavern was like walking onto the set of Star Wars. Wookey Hole has nothing on this place. After walking round the caves for precisely 40 minutes, the itinerary was very specific, it was time to go kayaking. You guessed it, for another 40 minutes. Paddling around the inlets was surreal. Like stepping into the photographs I’d seen all those times before. This feeling, of truly knowing where you’re meant to be right at that moment, is the whole reason I travel; Moments which take your breath away, leave you speechless and simply make you sit and appreciate the world. In my eyes, nothing can beat that. Soon enough to it was time to make our way back to shore, after beating the boys in race of course. After another fantastically fishy meal (which I enjoyed much more) and some painfully acidic red wine (it was the cheapest they had) it was time to retire for the evening. In possibly the comfiest bed since leaving home. Kudos Imperial Junk. The second day at the beach bungalows was the perfect opportunity to kick back and relax on the beautiful island. After swimming* to a nearby island. *The water was so shallow we walked over. I had my first go at beach volleyball. Unsurprisingly I was terrible. A painful reminder of PE lessons in school, I spent most of my time running in the opposite direction of the ball. Thankfully Sam (Manchester is awesome) and Matt (USA! USA!) didn’t give up on me and I got a couple of good whacks in. The kids, aged seven and nine, were much better at me than football. As children do, the little boy came up to me and said, “You’re not very good at this.” After explaining that this was first attempt at playing football, he acknowledged and went back to the game. Ten minutes later he came up to me again and said, “Don’t worry, you’re getting better now.” Praise indeed! Forty minutes later and my skin was glistening more than Edward Cullen in the midday sun – five weeks out of a gym was evident! I left the boys and the energetic kids to it and watched from the sidelines. An hour later, the boys ended up in a five-a-side match with the islands local team. The prize, ten beers, which they should have waved goodbye to as soon as the opponents walked on, in matching kit. Methinks they’d done this before. The game ended 7-6. To the locals. Great post, sounds like you had a good time, brings back good memories as you done the exact same trip as us. We stayed at Cat Pa island as well. We weren’t deemed good enough to be asked to join in the football though.